This is my best auction find to date. I found this distinctive instrument listed in a “clocks, stereophones, and canes” auction online. It was the only golf club in the auction. My guess is that it was in an estate with other canes (some of which were Sunday walking sticks with miniature golf heads on them). I may not have been the only bidder on the item, but there weren’t many, and I venture to say, I got this for a song. The putter is known as a “Kinnell Pattern” putter. 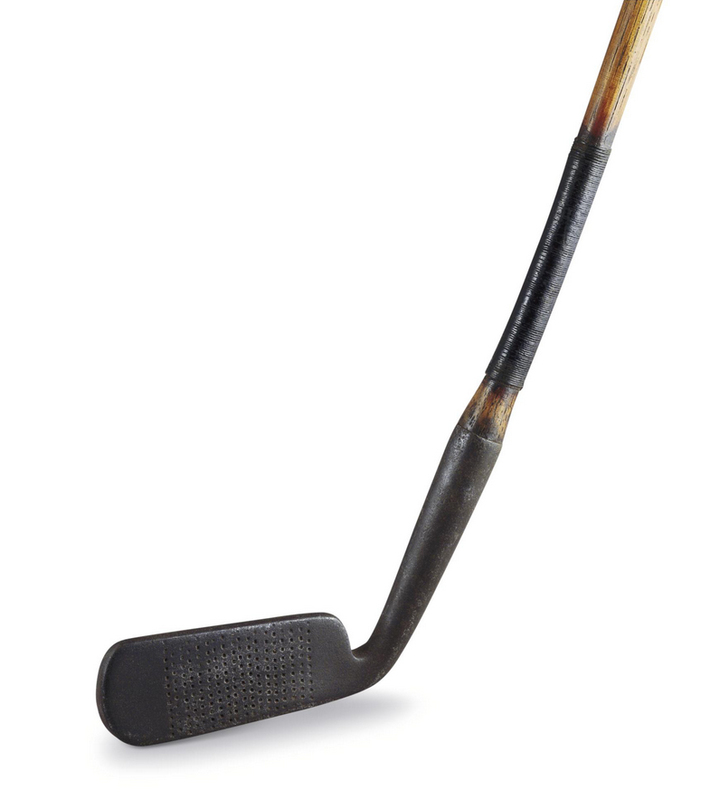 Per Ralph Livingston’s book, the putter is described as follows: “The shallow face on this model is most effective with the small ball and a sweeping swing. The extremely thick sole is one of the obvious changes from the original Kinnell pattern, which has a blade that is almost flat. The narrowing in the width of the hosel notch makes sense because it keeps the club from becoming too toe heavy. Most of the known examples of this long blade version are stamped for E. E. Foord, who was obviously a fan of the design. Differences in hosel length, blade height and blade length appear in every version. Changes in the game’s ball most likely led to experimentation with the dimension of this model club. These putters have an unusual balance, but are very enjoyable to use. 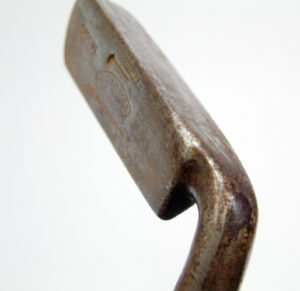 This length head is the most commonly found of the late model Kinnell Pattern Putters. 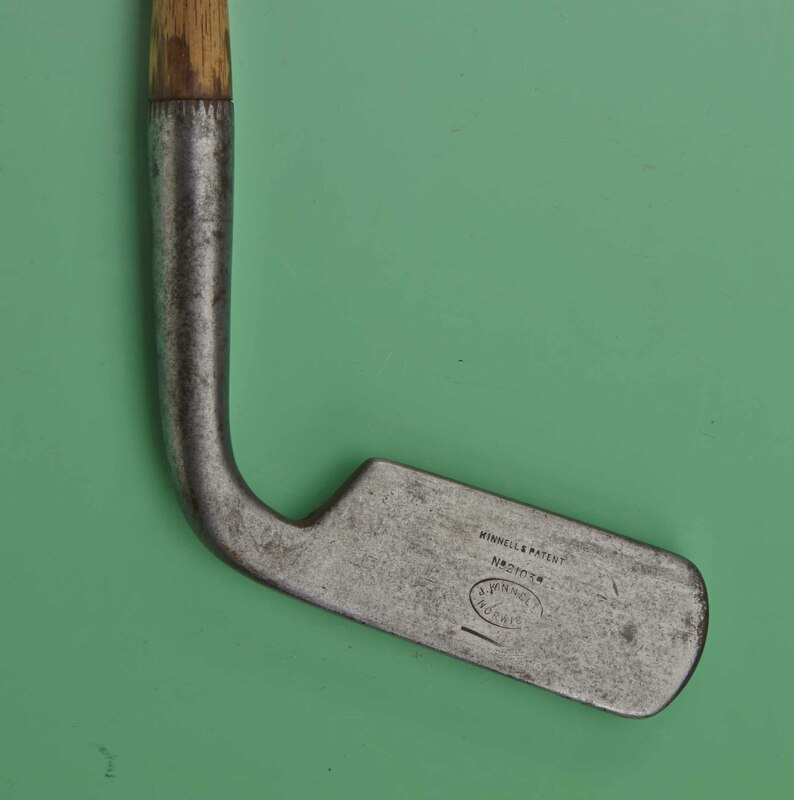 On the same date that I won this putter, I also won an absolutely gorgeous c.1870 dual-sided gun metal putter on eBay for just $51. That, too, was a steal. (A write-up on that club will be posted on our site as well). I posted a photo of the two putters on Facebook, and had two offers on the Stewart the same day. I hadn’t even received it yet! I took it out to play for the first time, recently, and am amazed by its performance. The club feels like it was made for someone precisely my height. It sits flush on the green and has a serious heft to it, with such a broad sole and thick baseline to it. With serious loft on the front face, it tends to put a small bit of backspin on a typical putt, which turns into forward roll within a foot of the strike – no real harm in this, in fact, it is kind of endearing. It may allow one to be a little more aggressive on the pass, with some of the inertia subsumed by the initial spin. I had no problems controlling distance with it, and found it quite desirable from the fringe. The design is a blast and I’m further intrigued that the only other versions I have found are all dot or lined-faced. As this is a SF, perhaps it is an early unit from Stewart’s forge; I don’t know. 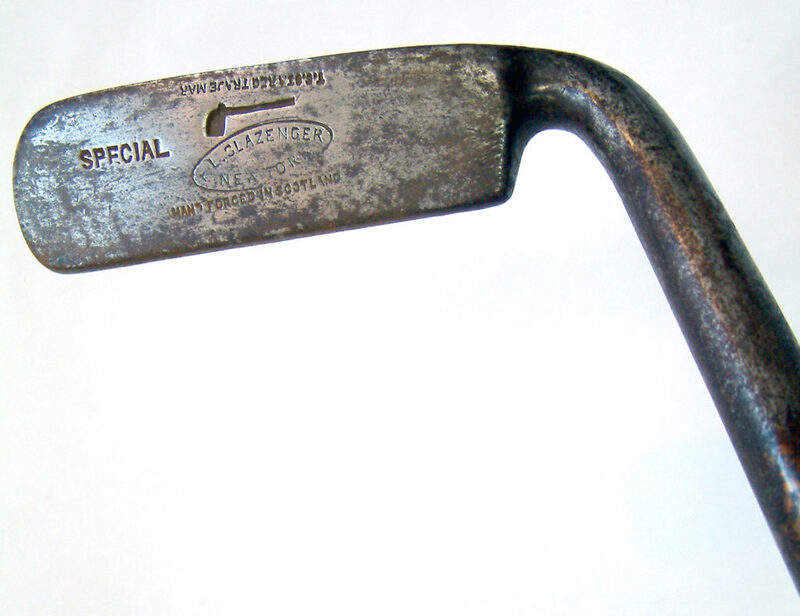 The write-up I found on this putter lists them in production from 1902 to 1916. Based in Leven, James Kinnell (seen front left in this 1903 images of Scotland’s international team photo) learned to play golf as a child. As a pro, he finished in the top-ten several times in the British Open. A clubmaking apprentice to his uncle, Alex Patrick, Kinnell then worked at a variety of clubs as pro and clubmaker, including Royal Norwich and Purley Downs [est. 1894 designed by JH Taylor]) until he left to fight in World War I, where he sadly was killed. The feature of Kinnell’s patent is the cut away at the neck which has the effect of setting the shaft further back. The blade is also longer than is usual and almost appears upside down. 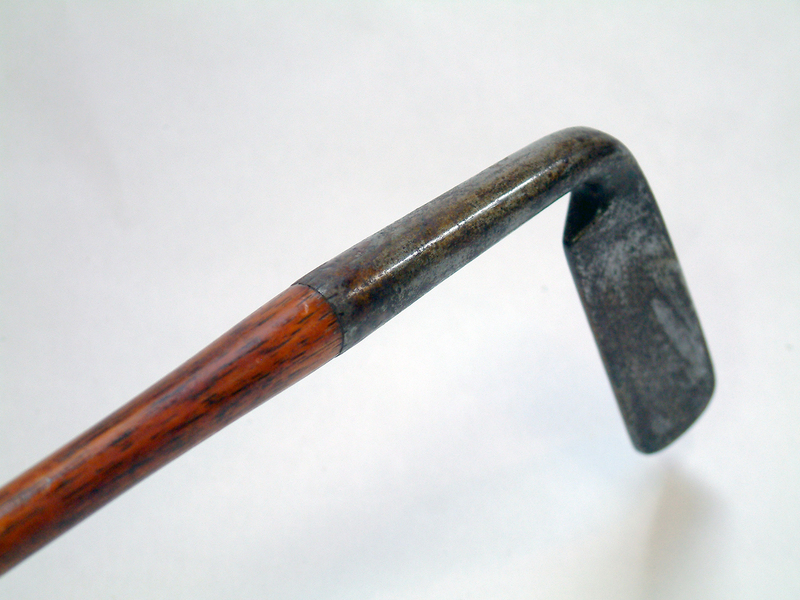 Variations of Kinnell’s putter were produced later by Tom Stewart. James was an outstanding amateur player at Leven Thistle Golf Club and turned professional at age 18. He was soon offered a professional post of his own, at Prestwick St. Nicholas, where he was joined by younger brother, David. In addition to making clubs on his own account, he was the “J” in “D and J Kinnell of Prestwick.” James moved south in 1900 first to take up a post at Royal Norwich and, in 1903, at Chingford. 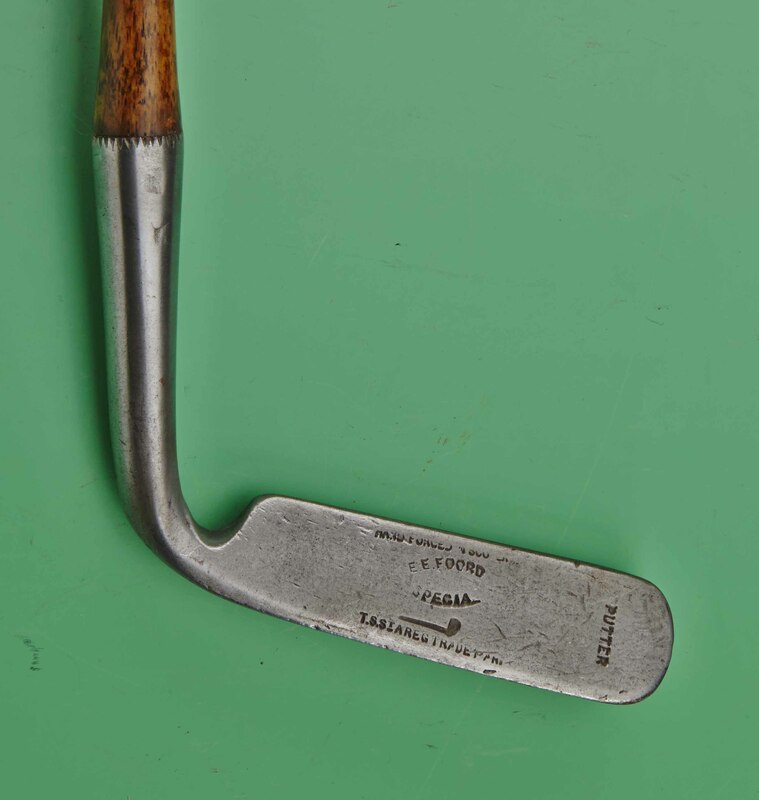 He patented a rather unusual putter in which the hosel flowed round the corner into the base of an extra deep head setting the shaft further back from the head. 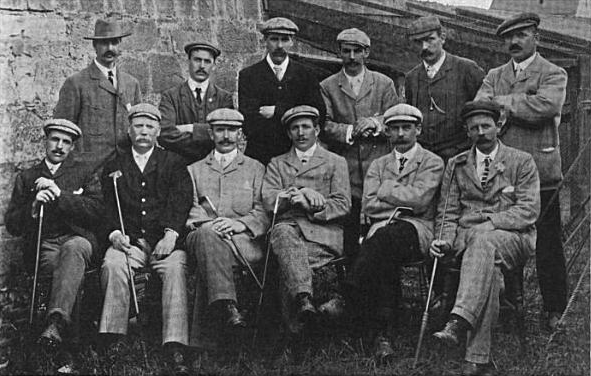 He had seven top 10 finishes in the Open Championship between 1899 and 1910. He also played in the inaugural two-day professional championship at Cruden Bay, outscoring Braid, Archie Simpson, Ben Sayers and Andrew Kirkaldy. He lost 3-and-2 in the final to Harry Vardon. He was with the Purley Downs club until the outbreak of the Great War. A club in Pennsylvania offered him a large sum to be their professional but he declined and, instead, joined the army to fight. Sadly, he was killed serving with the Royal West Kent Regiment, leaving a wife and seven children. By the way, I think I’m keeping this club in the bag!